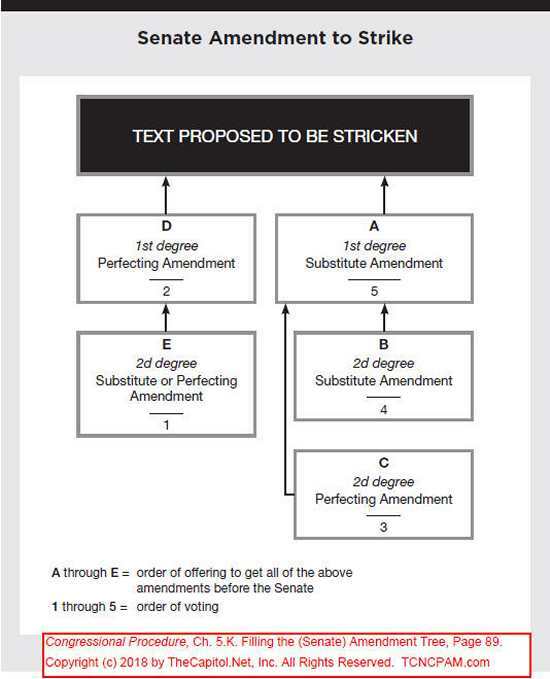 “Amendment trees” are charts that illustrate certain principles of precedence that guide the Senate amendment process. 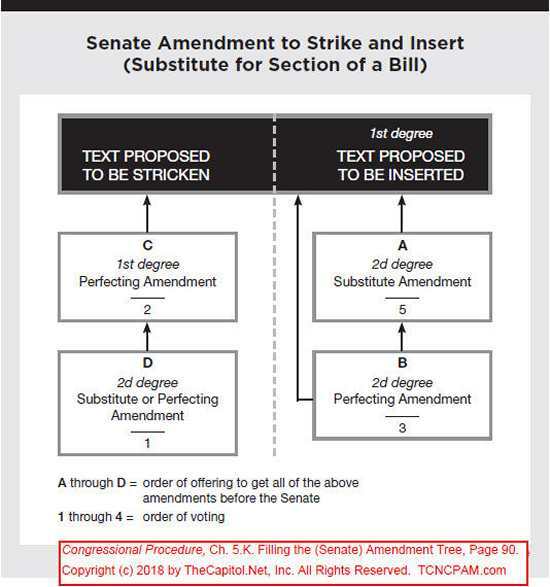 When all of the amendments permitted simultaneously by these principles of precedence have been offered and are pending, an amendment tree is said to be “filled,” and no additional amendments may be offered until one or more of those pending is disposed of or laid aside. Given that the presiding officer traditionally affords the Senate majority leader or his designee priority over all others in being recognized, a majority leader can repeatedly secure recognition and “fill the amendment tree” by sequentially offering all of the amendments permitted under applicable circumstances. By doing so, a leader can “freeze” the amendment process in place, blocking additional floor amendments, at least temporarily. Degrees of Amendment: Designations that indicate the relationship of an amendment to the text of a measure and of one amendment to another. Amendments are permitted only in two degrees. An amendment to the base text is called a first-degree amendment. Such an amendment can be further amended by either a substitute amendment (which is also a first-degree amendment) or a perfecting amendment, called a second-degree amendment. The substitute is also subject to a perfecting amendment. 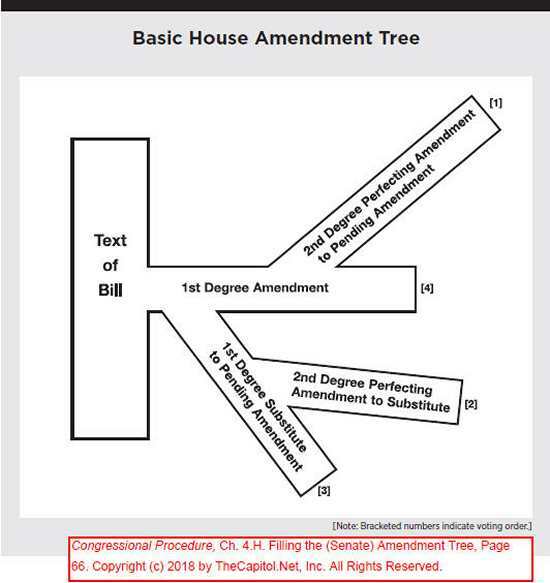 These four amendments constitute what is referred to as the amendment tree. Once an amendment to a measure is pending, either a perfecting amendment or a substitute amendment can be offered first. Substitute Amendment: Amendment that replaces the entire text of a pending amendment. A perfecting amendment is an amendment that alters, but does not completely substitute or replace, language in another amendment. The option of resolving differences between the two chambers, i.e., Amendments Between the Houses–the process of amendments between the chambers–allows two degrees of amendments. The amendment of the second chamber is considered text that is subject to amendment. Each chamber has one opportunity to propose an amendment to the amendment of the other chamber. The process is often conducted by informal negotiations between the members and staff of the committees of jurisdiction in the two houses. An extended exchange of amendments is rare. 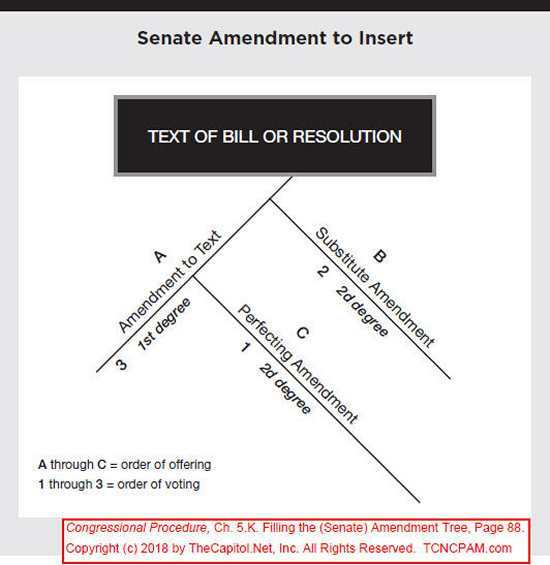 A majority leader might “fill the tree” in this way to prevent the offering of or voting on of non-germane amendments, to try to speed up consideration of a measure, or to control the subject or sequence of amendments that may be offered. 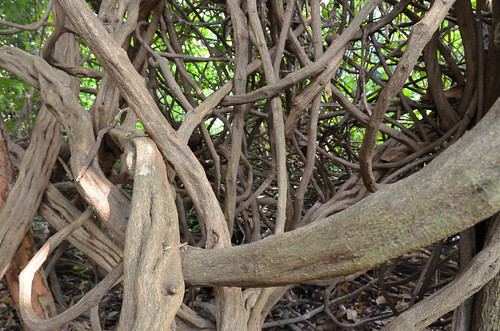 When an amendment has been disposed of, a branch of the amendment tree is open. An additional amendment may then be offered, provided that the new amendment does not propose to change what has already been amended.